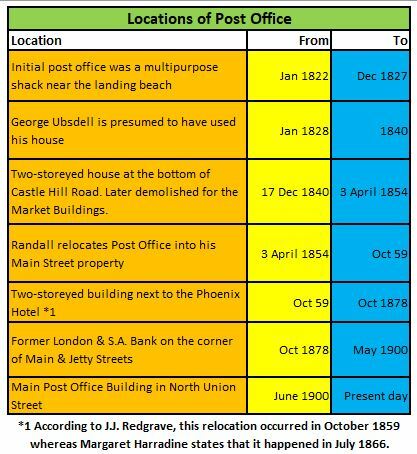 After much confusion and loss of mail, the Post Office had been relocated to the double storey house of the Harbour Engineer, Mr. Woodifield, adjacent to the Phoenix Hotel in Market Square. The first innovation, the use of prepaid stamps, had by now been accepted then the second radical change was proposed. 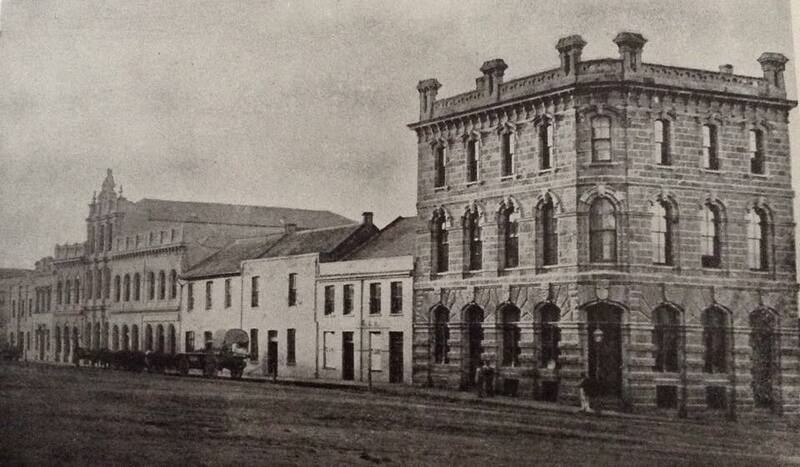 Main picture: Corner of Main & Jetty Street in 1876. Originally the London and SA Bank occupied this site and then it was taken over by the Post Office. Later the then Union Castle Mail Steamship Company took it over. The little building two buildings on the left was the original building of T. Birch and Co. The introduction of the first post box during January 1860 in front of the Grey Institute was to create quite a sensation. 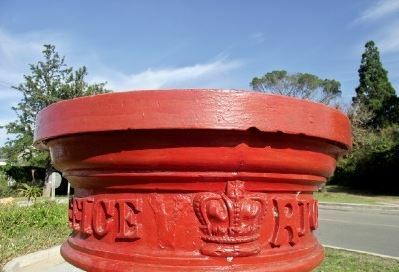 Residents of Port Elizabeth flocked to view this new-flanged contraption and were astounded at the convenience it afforded to the residents on the Hill who no longer had to traipse down the Donkin to the Post Office in order to mail their letters. 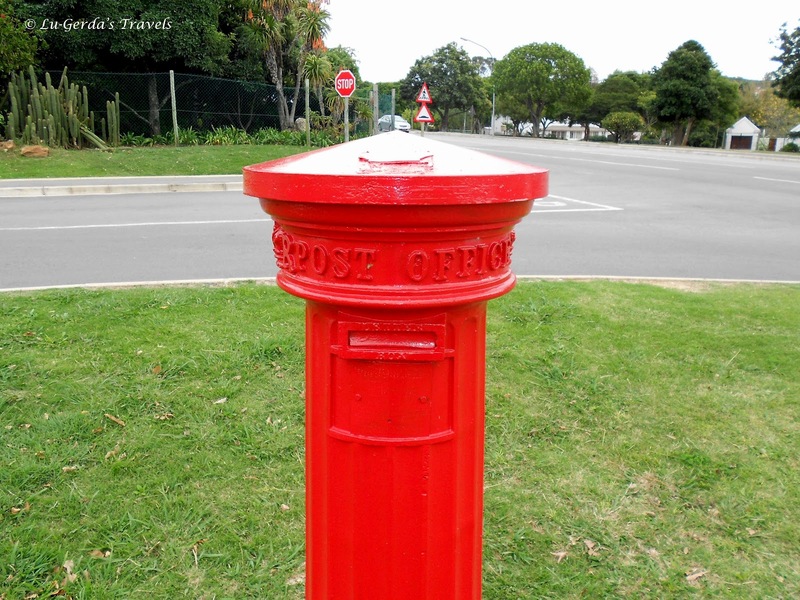 Port Elizabeth cannot claim to have been at the leading edge of technology introduction because in 1860 the first post boxes were erected in Cape Town. It cannot even claim to possess the oldest extant official letter box in South Africa as that honour is awarded a Post Box that stands on the corner Worcester and Somerset Streets in Grahamstown. The box is painted in the traditional Post Office red and is a fluted pillar box type which was manufactured between 1857 and 1859. It bears the letters “VR” [presumably meaning Victoria Regina] in curling script, denoting the reigning monarch, Queen Victoria, but sadly some of the insignia was removed by vandals at some unknown stage. 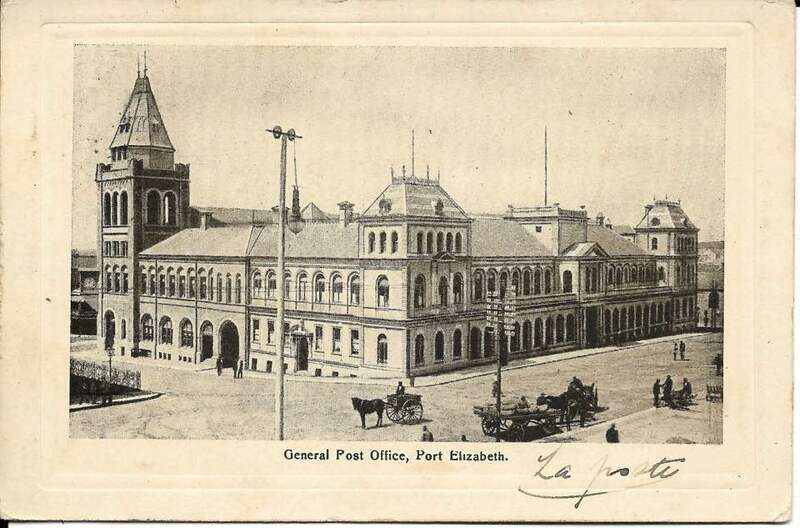 As if one innovation was insufficient, during 1861 the tireless Mr Wilmot was to introduce yet another innovation: The Penny Post within Port Elizabeth. 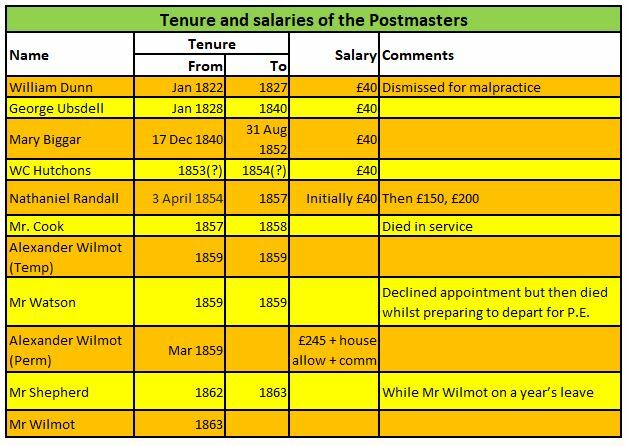 In terms of Wilmot’s proposal, the Post Office would employ am additional carrier at a cost of £60 per annum of which the Municipality would pay half. The postal service already employed Mr. McMahon at a stipend of £24 per annum for the delivery of the ordinary mail. Like all suggestions, however advantageous, it had its detractors and in this case the proposal generated some opposition. For the most part, the mail service was now operating efficiently. Like all operations, it experienced the occasional mishaps such as a mail cart breaking down at the Rawson Bridge over the Swartkops River. 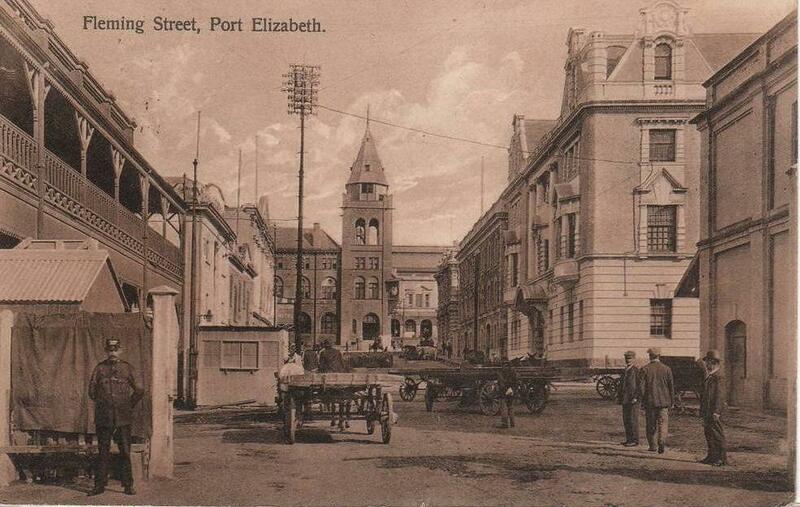 To the chagrin of the residents of Port Elizabeth, the mail from Grahamstown had to be brought in the slow way – by ox-waggon. Having bedded down the twin innovations of Post Boxes and the Penny Post, Wilmot applied for a year’s leave in England in 1862. 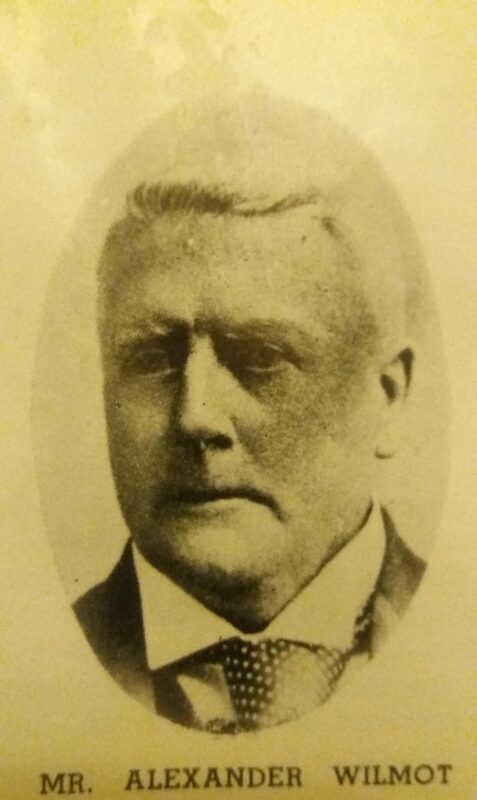 In his stead, Shepherd was appointed as Acting Postmaster. Several railway lines were completed and used to transport mail with the first mail train being introduced in 1883. Many years later, the railways took over the conveyance of mail in toto but the post cart survived until the arrival of motor vehicles as most locations were not serviced by the railway network. 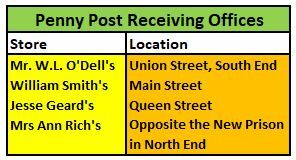 It was only in June 1900 that the first dedicated Post Office was opened in North Union Street. Designed by W.S. Greaves of the Public Works Department in Cape Town, it was faced with Paarl granite and Coega stone. It cost £60,000. Exactly twenty years later in 1920, the extensions to the Post Office building, designed by Hendrik Siemerink, were opened. This extension would be used for a more modern form of communication which would ultimately form part of a trio of innovations viz a telephone exchange. 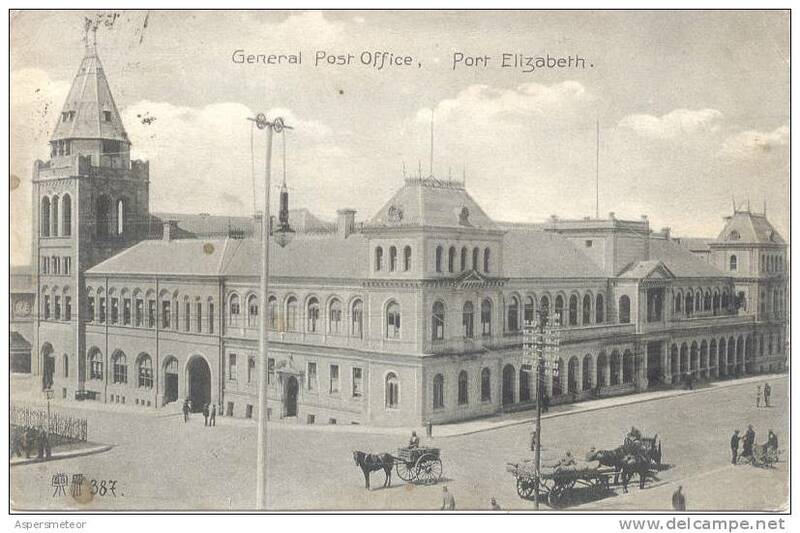 This building is today commonly referred to as the ‘(old) Post Office Complex’ but contains 4 conjoined buildings. The complex is situated on erf 3787 but officially referred to as erf 5645, which includes the parking lot at the bottom of Military Road (formerly the Parade ground). It lies directly behind the City Hall. 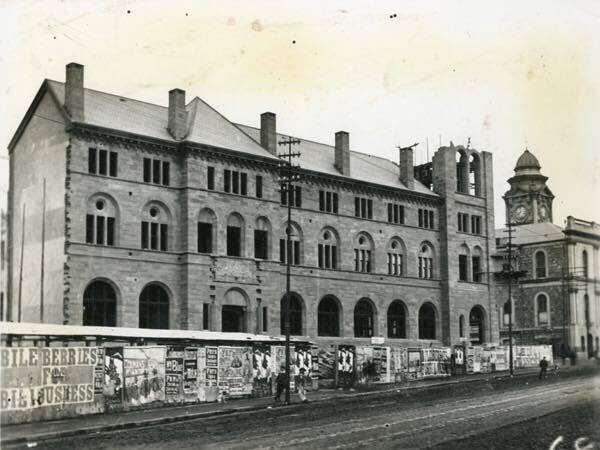 The Post Office/Courthouse/Police station were built by the Public Works Department and erected by J Kohler & Sons. The architect was H.S Greaves who completed the Parliament Buildings in Cape Town. The entire complex on erf 3787 was declared a National Monument on 26 October 1984 and is now a Grade 2 structure. 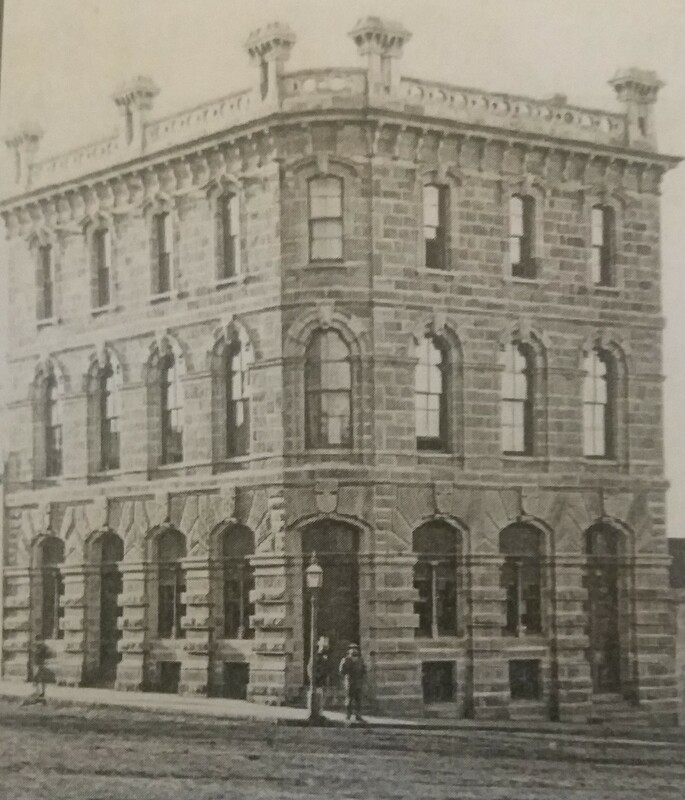 The oldest part is the old Magistrate’s Court (1885) onto which the Baakens Street Police Station (and Police barracks) was built (1899) in the same style as the courthouse (this faces onto the Feathermarket Hall). The Post Office (1897) facing Fleming Square with its “Rhineland” style tower, has on its corner the later telephone exchange (1919/1920). Plans drawn up in 1897 show the original appearance of the Police station and Post office additions completed around 1902. 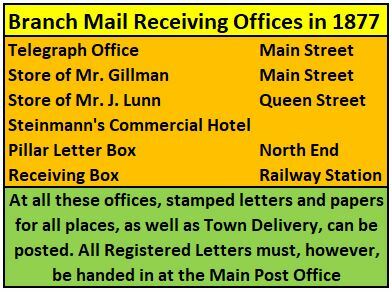 The Court moved to the ‘new’ buildings in North End in 1934 and the post office took over the vacated part of the building (Consolidated erf from 1938). The central courtyard boasts some interesting later additions and a mix of various architectural styles. There is evidence that BJ Vorster was held in the below-ground cells of the Police station (amongst others) and there is still evidence of struggle-era graffiti. When the new Post office was built in 1988, there was a proposal for CAPAB to take over the building and utilize it for the arts. This never transpired and the complex was sold by the Metro in 1990 to a Mr. Halgryn, who sold it to Mr. K. Denton in 2002 under Ummi Properties. After years of pressure, Denton repaired the exposed wooden skeleton of tower on the Post Office section in 2007, without approval from the PHRA permit committee. It is not known if the intricate guttering system within was retained. The public has had virtually no access to the site, although an enforced inspection allowed architects to inspect a limited (less damaged) section. There has been very extensive water damage that has weakened brickwork and destroyed portions of the moulded plaster sections of the ballroom, and serious damage to the Baakens Street elevation. With regards to more recent work performed (from 2010), there are several sections which appear to have been demolished. Witnesses have seen demolition work taking place in July 2009 in the ‘cart lane’ between the Post Office and Courthouse. A top floor external wall was being knocked down into the Cart Lane with bricks being loaded into a skip, out of view. Externally, the damage became visible with the repairs to the roof in February /March 2010. The first brick chimney was demolished from the Courthouse and then the dormer air vents. The next chimney to be demolished was the Coega stone chimney between the Post Office and Magistrate’s Court. It was the last such example to remain from the original building. All the remaining brick chimneys from the Courthouse and Baakens Street Police station examples have now been removed. (Five visible from the Street level and at least three hidden from view). The most severe damage inflicted on the building is on the Baakens Street Police station section, where an entire floor, gables and chimneys have been demolished since the end of 2010. The building has significant architectural, social and political importance, and has huge tourist value and potential, apart from the Victorian architectural value of the building. Years of pressure has come to nought, and a section 34 charge was originally laid by members of the public in 2011. This after a new roof began to go up. Permission was given for “essential repairs” but the work progressed far beyond this. The case now sits with the public prosecutor (as at present, July 2016), who awaits information from the PHRA. The property owner in question, Kenneth James Denton, has, since 1998, owned a large portion of historic houses (many national monuments) and has allowed them to deteriorate for well over a decade. Other examples include the Donkin Street terrace houses, now completely and illegally altered beyond recognition. See also, Victoria House (c.1824), also owned by Denton, along with two Victorian Houses demolished outright. New technologies have now placed the original postal service on the critical or endangered list. 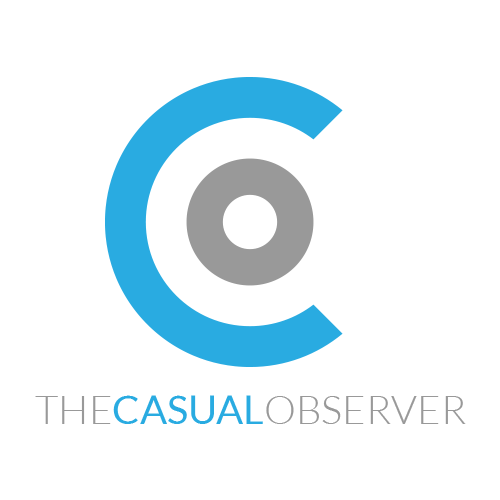 Foremost amongst them is the U.S. Postal Service which is reported to be in terminal decline. Originally deliveries from Amazon.co.uk took two to three weeks to be delivered. Now they take two to three months. Maybe the SA Postal Service is also in terminal decline?